John Garvin Weir was born on the 2nd July 1984, in Coatesville, Pennsylvania USA, of Norwegian descent. He is probably best known for being a former professional figure skater, who won the bronze medal at the 2008 World Figure Skating Championships, two bronze medals at the Grand Prix Final, as well as the 2001 World Junior Championship, plus being a three-time US national champion. His career was active from 1996 to 2013. So, have you ever wondered how rich Johnny Weir is? As of mid-2016, it is estimated by authoritative sources that Johnny’s net worth is over $1 million, accumulated not only through his sports achievements, but also through his subsequent involvement in the entertainment and fashion industries. 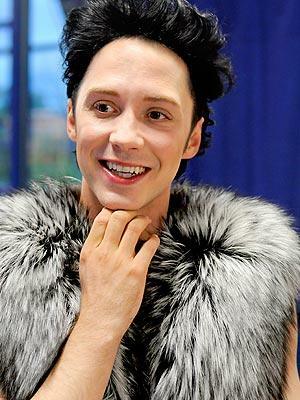 Johnny Weir was raised with his younger brother in Quarryville, Pennsylvania by parents John and Patti Weir. As a child, he distinguished himself as an equestrian, and he competed with his pony. However, his interest changed when he was watching Oksana Baiul became the 1994 Olympics skating gold medalist, and soon after he began skating when he was 12 years old, and the family relocated to Newark, Delaware, so he could be near his coach. There, he attended Newark High School, after which he enrolled at the University of Delaware to study linguistics; however, he quit education and moved to Lyndhurst, New Jersey, where he continued training in skating and pursuing a career in the sports industry. Before Johnny focused on single skating, he began competing in pair skating with Jodi Rudden. His first big victory came when he was 16 years old, becoming a gold medalist at the World Junior Championships in 2001. In the same year, he made his competitive debut at the senior US Championships, finishing sixth. In the 2003 season he suffered from a knee injury, so he needed some time to recover. Until that time, he represented the University of Delaware FSC, and then he switched to the Skating Club of New York, and his net worth began to improve. In the 2003–2004 season, Johnny won the gold medal at the US Championships, and then he finished fifth at the World Championships. The next season was one of his best, as he won his first two Grand Prix titles, and the 2004 NHK Trophy in Japan, which increased his net worth. Thereafter, his career declined in the next three seasons, so he left his coach, moved to New Jersey, and began to train with train with Galina Zmievskaya. This change brought him prosperity, as he had a great start at the 2007-2008 season, as he won gold medals at the Cup of China, where he achieved new personal best scores, and at the Cup of Russia, contributing further to his net worth. Johnny began the next season by becoming the Skate America silver medalist, after which he also won the silver medal at the NHK Trophy, increased further the overall size of his net worth. These medals qualified him for the 2008–2009 Grand Prix of Figure Skating Final, finishing with the bronze medal. However, the season was unsuccessful for him, as he contracted a stomach virus, so was unable to compete further. For the next season, his competitive programs were created by David Wilson, a top skating choreographer, and he won the silver at the NHK Trophy, which qualified him for the 2009-2010 Grand Prix Final in Tokyo, Japan, where he took the bronze medal. Thanks to that, he became a member of the US team for the 2010 Winter Olympics, finishing sixth. After that, he missed the next seasons, and in 2013 announced his retirement. Apart form his successful career in the sports industry, Johnny is also known as a person who is involved in the entertainment industry. He has appeared in a number of skating shows, and filmmakers David Barba and James Pellerito made not only a movie about him entitled “Pop Star On Ice” (2009), but also the TV series “Be Good Johnny Weir” (2010-2012). He is also known for publishing his autobiographical book “Welcome To My World”, which has added a lot to his net worth, and he also tried himself as a singer, recording the song “Dirty Love” in 2010. Other than that, Johnny is active in the fashion industry as well. Regarding his personal life, Johnny Weir announced in his autobiography that he is gay; he was married to Victor Voronov from 2011 to 2015. Currently, he is single and his residence is in Lyndhurst, New Jersey. 1 2008 Grand Prix figure skating final bronze medalist. 2 2008 World figure skating bronze medalist. 4 2001 junior world figure skating champ. 5 2004-2006 U.S. national figure skating champ.